This book studies the role of the EU in peace and security as a regional actor with global aspirations, in the context of challenged and changing multilateralism. Multilateralism, governance and security are three concepts that have attracted a great deal of attention in the past decade and attempts to redefine them have produced lively conceptual debates. More recently, different strands of the literature have found common ground in the investigation of the EU’s role in what has been labelled ‘multilateral security governance’. Despite being frequently used, the term is yet to be fully clarified, and empirically explored. 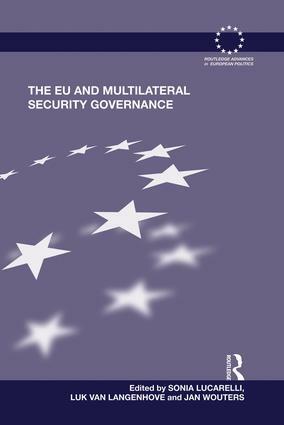 To contribute further our understanding of it, this book presents a conceptual and empirical exploration of ‘multilateral security governance’ and the EU’s role in it. Expert contributors in the field analyze both traditional and non-traditional security areas, to investigate if and how multilateral security governance functions, and how the EU contributes (or fails to contribute) to the functioning of multilateral governance. The EU and Multilateral Security Governance will be of interest to students, scholars and practitioners of EU politics, security studies and governance. Sonia Lucarelli is Associate Professor of International Relations at the University of Bologna, Italy, and Director of Research at the Forum on the Problems of Peace and War in Florence, Italy. Luk Van Langenhove is Director of the United Nations University Institute on Comparative Regional Integration Studies (UNU-CRIS) in Bruges, Belgium. Jan Wouters is Jean Monnet Chair ad personam EU and Global Governance, Professor of International Law and International Organizations and Director of the Leuven Centre for Global Governance Studies/Institute for International Law at the University of Leuven, Belgium.